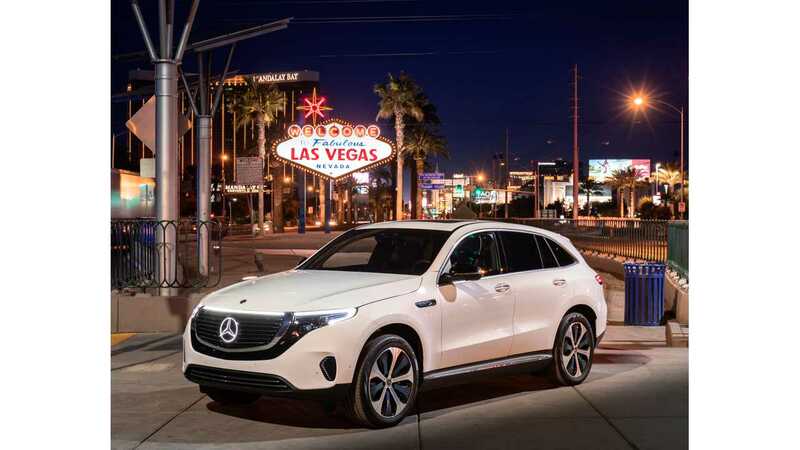 Crusing down the strip in Las Vegas in the Mercedes EQC 400, it's very possible to completely forget you're in an electric car. The lights, outside music and inevitable slow crawl in Vegas strip traffic can remove some of the most enjoyable features of driving electric; that being the instant torque of the electric motor, the quiet cabin and smooth vibration-less acceleration. So I was definitely pleased when Mercedes informed me we'd be leaving the lights and action of the Vegas strip, and venturing out to Red Rock Canyon for my EQC ride-along. Better yet, we were leaving before dawn, therefore, cruising around the winding canyon roads just as the sun rose. The Mercedes EQC at Red Rock Canyon, Nevada at dawn. Yes, I said ride-along, as Mercedes isn't allowing any EQC press drives just yet, the sole exception being Jay Leno last week, but hey, he is Jay Leno. Luckily though, the driver was Mercedes engineer, Bastian Schult, who knows how to drive, and was more than willing to prove that. When urged, he even pushed the EQC to the point of slightly drifting around a few of the tight curves the canyon provided. Perhaps aided by the morning dew on the road, but yes, you can drift in an EQC. In hindsight, I really wish I had a drone recording us as we carved up the winding roads of Red Rock at dawn. 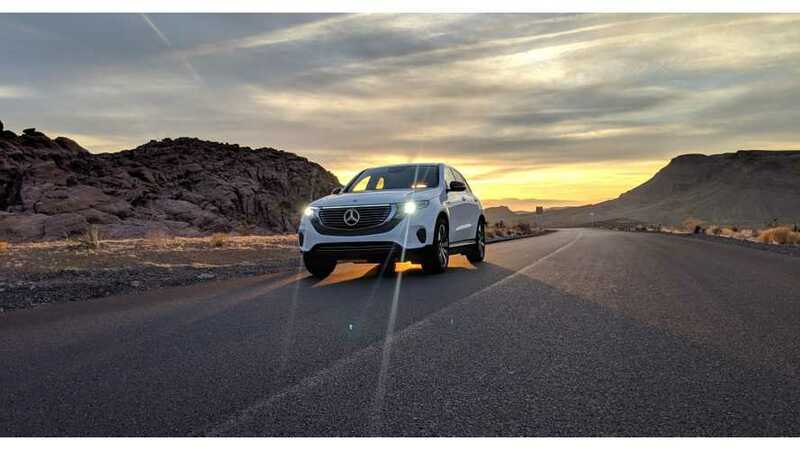 Schult was enjoying himself a little too much for the other Mercedes representative sitting in the back seat, who, more than once had to say, "OK, that's enough of that," before Schult eased off the accelerator and slowed down. The EQC is not a dedicated-platform EV. It shares many components with the C-Class and GLC line. It's going to be manufactured on the same line as the C-Class and GLC in Daimler's plant in Bremen, Germany. 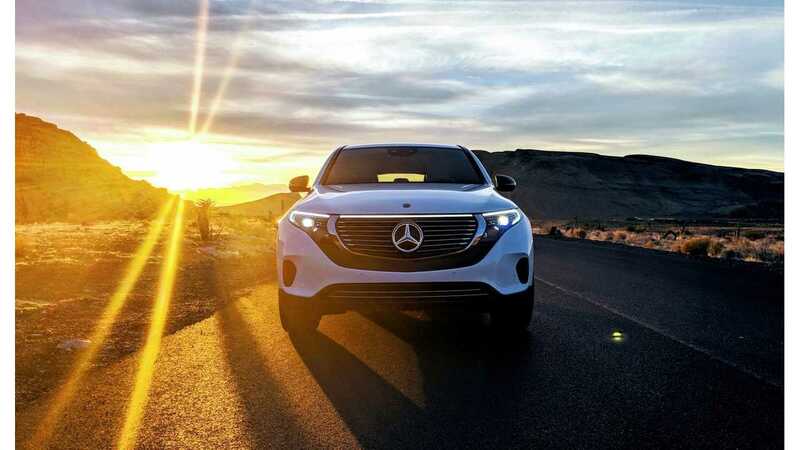 Mercedes told us that by sharing the production line and components, they could easilly increase or decrease EQC production as needed to meet market demand. Europe will be first to get the EQC, with the launch planned for June 2019. The US will have to wait 7 or 8 months longer, until early 2020. We believe the fact that the EQC doesn't have a dedicated platform is the reason why there isn't any storage space under the hood, and also probably part of the reason why the EQC weighs in at a porky 5,346 lbs. We were also told that the next few vehicles coming from the EQ line will be larger than the EQC, and have dedicated platforms, and be made at Mercedes' Tuscaloosa, Alabama plant. In all, there will be 10 all-electric vehicles from Mercedes by 2022. As for range, Mercedes has been quoting 400 km, which is based on the European WLTP range test. Shult has been driving the EQC for a while now, and knows exctly what it's capable of. He told us of a recent trip when they drove the vehicle (normal driving not hypermiling) 228 miles and had 7% battery left. He added that we'd have to wait for the official EPA range rating, but that he expects it to be about 220 miles. That seems about right if you do the math based on the 400 km WLTP rating (by the way, the "400" in the EQC 400 name, is based on the 400 km WLTP rating). On other EVs, we've noted that the EPA rating has been roughly 10% - 15% lower than the WLTP, and 220 is 12% lower than the 249 mi (400 km) the EQC was rated. For what it's worth, the car estimated that it had 230 miles of range when we started out in the morning, fully charged. The EQC is equipped with a 32-amp onboard charger, good for AC charging up to 7.4 kW. The car will come with a 120-volt portable EVSE in the US, and Mercedes will offer Level 2 charging options for purchase. As for DC Fast charging, the EQC will accept up to 110 kW, allowing the vehicle to charge from 10% to 80% in about 40 minutes. I asked why Mercedes didn't match the Audi e-tron and provide 150 kW charging, and was told that they believe 110 kW works fine for the 80 kWh battery. If the battery was larger, then they would have possibly allowed a higher charging rate. It was further explained that Mercedes believes 10%-80% in 40 minutes is "quite good" for a 200+ mile EV in today's market. There are four driving modes, plus an Individual customized setting. The four standard modes are: Comfort, Sport, Eco and Max Range. The car always defaults to Comfort upon startup. In Sport mode the car offers the most dynamic performance, with more power available off the line and more direct steering response. In Eco the car offers less power and is more efficient, and in Max Range, the vehicle will deliver the maximum possible range. Our Mercedes rep warned us that it's not fun driving in Max Range, but it will get the driver most range available. Individual mode allows the driver to personalize certain driving characteristics to their liking. The EQC's interior and dashboard is typical Mercedes. Beautifully laid out, and luxurious. The MBUX infotainment system looks great. The EQC has five different levels of regenerative braking. The most interesting is the default setting, called Auto. In this mode regenerative braking is constantly adjusting based on topography, traffic, stereo cameras, and radar data, to intelligently set the strength of regeneration. Mercedes believes most drivers will appreciate how well this mode works, and use it for the majority of their driving. For those who want stronger or weaker regeneration, there are paddles on the left and right side of the steering wheel, just like Hyundai has on the Kona Electric. D – – (high recuperation). This makes one-pedal driving possible, because in most situations the recuperative deceleration is enough not to require operation of the brake pedal. The EQC has two asynchronous 150-kW motors that deliver a total of 408 hp and 564 lb-ft of torque. That's good enough to propel the heavy EQC for 0-60 mph in 4.9 seconds. As mentioned above, our driver really gave us a good idea of how well the electric crossover can perform when pushed, and it was definitely impressive. Hopefully, we'll get the opportunity to drive an EQC ourselves closer to the European launch. Even though the two motors both produce 150 kW of power, they aren't created equal. The motor in the front has only 5 windings, and is more efficient than the rear motor. The front motor will do most of the work by itself unless more power is needed. When that happens, the rear motor, that has 7 windings and is less efficient, is called upon to join in. The cabin is extremely quiet, and is perhaps the quietest EV I've ever driven in, that says a lot. Mercedes spent a lot of time eliminating as much noise as possible, and it's still not exactly where they want it to be. We were told this vehicle didn't have the glass for the side windows that the production version will, which will be milimeters longer to close even the slightest gap that currently allows some outside noise in. The EQC has an 80 kWh battery, which we found out during the drive is the usable capacity, not the total. The pack, the power electronics and drive motors are all liquid-cooled, and the vehicle also employs a heat-pump. There's a lot to like about the EQC. Personally, I like the exterior design, and I really like the interior, for both comfort and user experience. The Mercedes MBUX infotainment system is easy to navigate and intuitive. The Voice controls didn't work very well, but I was assured that was because this was a pre-production vehicle and not made for the US market, which caused some connectivity issues. The EQC has plenty of power and performed surprisingly well for a heavy crossover. Ride quality is what you'd expect from a Mercedes, as bumps and road irregularities disappear without notice under the vehicle. However, when called upon, the EQC can handle corners at speeds that most owners will never push it to. The cabin was exquisitely quiet and perhaps the quietest EV to date. There is plenty of cargo space behind the rear seats, (I forgot to confirm if the rear seats fold flat) and it can tow a respectable 3,968 lbs. On the negative side, I think Mercedes dropped a ball on charging rates. 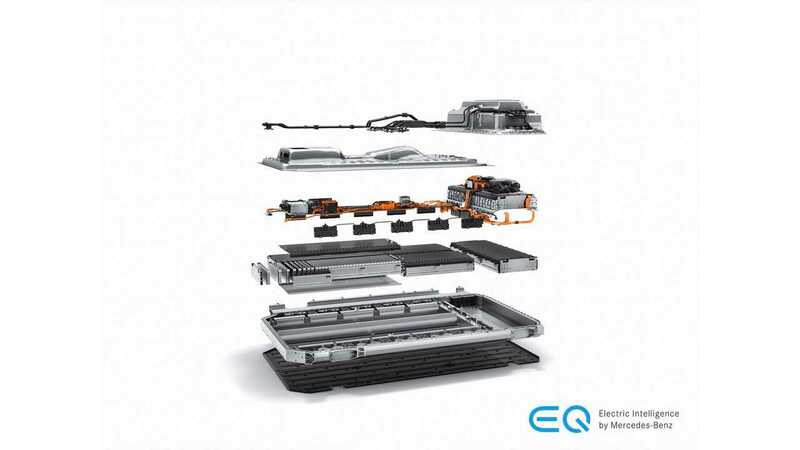 In my opinion, large battery EVs like the EQC should have level 2 charging at 40-amps or 48-amps, like the Audi e-tron and Model 3, respectively. The 32-amp onboard charger will take about 11-12 hours to fully charge the EQC from empty. A 40-amp charger would cut that down to about 9 hours, and charging at 48-amps would be about 7.5 hours. However, the 110 kW DC fast rate is probably an even bigger fumble. Granted, there aren't many cars that can charge at more than 110 kW today, but there will be in 2020 when the EQC launches in the US, and there will be quite a few charging stations that can deliver 150+ kW, courtesy of Electrify America. While other manufacturers quoting DC fast recharging times often say, "Up to 80% in 30 minute," Mercedes has to say "10-80% in 40 minutes." We realize that might not be a big deal for many Mercedes buyers, especially those new to EVs. However, experienced EV owners understand how the extra 10 or 15 minute wait at a DC Fast charge station can be at the very least, annoying. The Audi e-tron, for example, is larger, has a bigger battery, can charge at 150 kW. Plus, the BMW iX3, another EQC competitor launching in 2020, will also support 150 kW charging. Mercedes should have offered the same 150 kW charge rate as the competition in our opinion. That brings us to the price. Mercedes hasn't yet announced pricing, so it's difficult to really say how we feel about the EQC. If Mercedes can manage to keep the price at or under $75,000 we think it's a good buy relative to the competition. The larger Audi e-tron lists at $79,500 and the smaller Jaguar I-Pace starts at $69,500. Both of which have larger batteries, but very similar ranges and standard features. Tesla dropping the Model X 75D was a belated Christmas present to Mercedes, as well as to Audi and Jaguar, because the least expensive Model X is now the 100D, which starts at $97,000. That really opens up the market for the three European competitors (plus the BMW iX3 in 2020) to gain back some of the ground that Tesla had taken from them. Well, at least until the Model Y becomes available.